We Specialize in TOMCAT® Discount Parts & Repairs For Blue Diamond®. PURCHASE THE POOL CLEANER SHIPPING BOX SET. YOUR BLUE DIAMOND® FOR REPAIR. that you will adhere to the box with your machine. shipping due to improper packing. This picture shows what can happen to your pool cleaner when it is not packed properly. If you would like a call tag to send your Pool Cleaner in to us at no charge you may do so by clicking on the shopping cart link below. We will E-Mail you a FedEx label that you can affix to your packed up pool cleaner. You then simply leave the package out for FedEx to pick up at your place of business (if you have regular pick-ups) or you must bring it to a FedEx store. Once we receive your cleaner, we will diagnose it and call you with an estimate. If you choose to not fix the cleaner and still want it shipped back to you, you will be responsible for a $100.00 bench fee for our time diagnosing the cleaner, and $50.00 for return shipping. If you choose to repair the cleaner than you will be responsible for parts, labor & return shipping. Lastly, you may choose to not fix the cleaner and tell us to dispose of it and you will not be responsible for any charges whatsoever. To minimize damage to your pool cleaner, and to expedite your repair, consider the Pool Cleaner Shipping Box Set below. It is a convenient, no-hassle way to ship your pool cleaner. This set includes all the materials needed to safely ship your pool cleaner to us. This set also includes the call tag so that your box can be shipped out. This is a double walled corrugated cardboard box with inserts that are specifically designed for packing and shipping automatic pool cleaners. 1.) You will receive a flat Shipping Box Set which is packed with the above contents. 2.) Slice open the tape that is sealing the box closed. Remove contents. tape to seal the edges of the bottom. 4.) Sit box upright. Open the clear outer wrapper holding one of the expandable foam pouches (DO NOT OPEN THE BLUE PLASTIC BAG ITSELF). Unfold the blue plastic bag, make sure to keep A & B face up. Follow directions on blue bag on how to mix the foam. These are the directions re-iterated: Press down with the palm of your left hand onto A until you pop the inner bag. Then, pressing with your right and left palm going back and forth mix the two contents together until your right palm pops the second inner bag. The paste on the inside must be spread to the top and sides with your palm as it is heating up to ensure full coverage. The paste will expand into foam. Lay this first expanding foam puch down onto the bottom of the back and power supply in the center of the bottom with the cable surrounding it. 5.) Make sure your handle is locked straight along the top and folded down against the robots body. Place your pool cleaner inside the box, on top of the power supply & cable. 6.) Repeat step (4) to get the next piece of expanding foam ready to be inserted. Once mixed, place the foam so that it is in between the side plate and the box, but also so that the top area is folded and resting on top of the cleaner, protecting the top portion of the robot. 7.) Repeat step (6), but now place the foam pack on the other side, protecting the other side plate. 8.) Repeat step (4), but now place the foam pack in between the brush and the box, protecting the front face of the robots body, as well as folding it over the top. 9.) Repeat step (4), but now place the foam pack on the other side, protecting the other face of the robots body. 10.) Once all the foam packs are in place, close the flaps of the box and tape them shut. 11.) Adhere the packing slip pouch to the top of the box. check-in form and policy letter into the pouch and seal. 12.) Adhere the call tag to the top of the box. a bench fee plus return shipping. Aquaquality Pools & Spas, inc. are the experts in Aquabot® Repairs. Service your Aquabot® yearly to eliminate high cost Aquabot® Repairs. Let us diagnose your Aquabot® to get it functioning properly to clean your pool. Aquabot® Repairs can be quite costly, but do not let that get you down. Here at Aquaquality we are not only experts in Aquabot® Repairs but we have affordable prices. Aquaquality Pools & Spas, inc. manufactures their own replacement parts TOMCAT®. This can decrease the cost of your Aquabot® Repair a substantial amount. Not only are these parts affordable, but they work! We have used TOMCAT® on Aquabot® Repairs for many years. Get your Aquabot® repaired at an affordable price and back in your pool in no time! Blue Diamond® Repairs can be quite costly, but do not let that get you down. Here at Aquaquality we are not only experts in Blue Diamond® Repairs but we have affordable prices. Aquaquality Pools & Spas, inc. manufactures their own replacement parts TOMCAT®. This can decrease the cost of your Blue Diamond® Repair a substantial amount. Not only are these parts affordable, but they work! We have used TOMCAT® on Blue Diamond® Repairs for many years. Get your Blue Diamond® repaired at an affordable price and back in your pool in no time! Aquaquality Pools & Spas, inc. has a fully equipped repair facility for robotic pool cleaners, now including Dolphin Repair. Just follow the link for Dolphin Repair for instructions on sending your pool cleaner to Aquaquality Pools. You can visit Aquaquality at 169 Post Avenue, Westbury, NY 11590 to purchase Dolphin Pool Cleaner Parts or to drop off your Dolphin Robotic Cleaner for a repair estimate. Now that Aquaquality is offering parts and repairs for Dolphin / Maytronics automatic pool cleaners, you can rest assure that getting replacement parts is finally a snap. Just follow the link for Hayward Tigershark® Repair for instructions on sending your pool cleaner to Aquaquality Pools. Blue Diamond® / Water Tech Corp. Whether you’re looking for a reliable service, or have questions about your Aquabot® Aquaquaity Pools & Spas is the place to go. 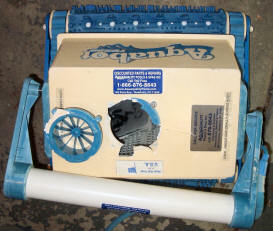 We can get your sluggish Aquabot® Repaired to clean your pool how it used to. Do not settle for a slow pool cleaner that is on its way out, call us for the maintenance your Aquabot® needs.